Take even a cursory look at Ken Simon’s social media feed and you’ll see his “turn up” pose. Ever since the Concordia University Ann Arbor music major debuted it four years ago in front of hundreds of his CUAA peers, it’s become a campus trend. The gesture originated during the fifth-year senior’s junior year. He had volunteered to participate in the Mr. CUAA competition, a riff on the Miss America beauty pageant. Like a typical beauty pageant, Concordia’s competition included an introduction, evening wear, talent, and question portion in order to determine the most spirited Concordian. It was during the introduction portion of the competition that the congenial Ken made his way to the center of the Field House and whipped out his trademark pose: arm straight up in the air, palm facing the sky. Now Ken, who is a percussionist in the CUAA Pep Band, regularly busts out the move on the sidelines of athletics events, he litters social media feeds with it, and nearly every interaction he has with friends in passing is accompanied by a hand cocked upwards. You could call the “turn up” pose a manifestation of Ken’s zeal for Concordia—and life in general. No matter where he’s at on campus or what he’s doing, Ken wears his passions on his sleeve, and the attitude is contagious. On Sunday, May 20, Ken will graduate and carry his uncommon enthusiasm into the world. After graduation, he’ll pursue a master’s degree in church music at the University of Michigan, where he’ll devote himself to one of his other great passions: music. Ken’s love of music began when he was young. His mother, a gifted clarinetist, first began to instill an appreciation of it through a Kinder-music program she enrolled Ken in. Ken went on to join the prestigious Boychoir of Ann Arbor, and eventually enroll in Pioneer High School in Ann Arbor, where his musical talents continued to flourish. Since 2010, he’s been a regular musical contributor at his church as well. At Concordia, he added to his music portfolio by joining Concordia’s Wind Ensemble, Cardinal Regiment, Drumline, Worship Arts team, Pep Band, and the Concordia Choir. CUAA also gave him the opportunity to tour Europe and perform at Carnegie Hall and the Chicago Symphony Center. 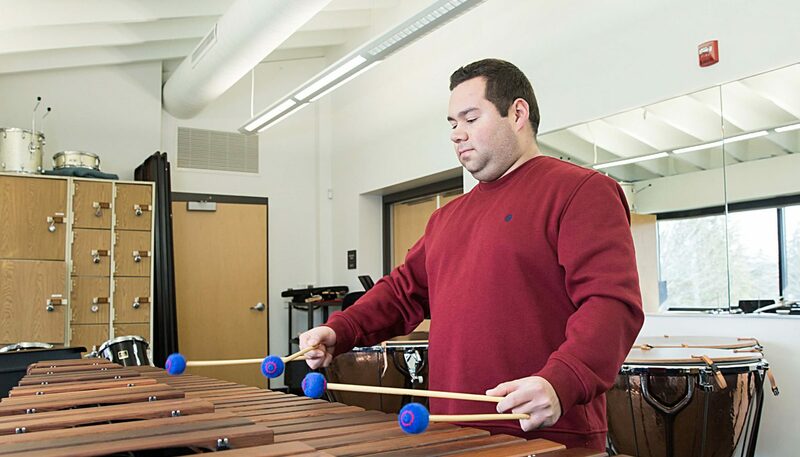 From the beginning, Ken knew he would pursue a career in the music field, but it wasn’t until his fourth year at CUAA that he determined he wanted to go into church music. Ken says he marvels at the power music has to move people. He’s witnessed numerous times when music combined with worship has resulted in awe-inspiring moments. One time in particular happened last year during Concordia’s annual Tool Time retreat, which invites high school students onto campus to engage with student speakers, live worship music, hilarious skits, and fun games. The goal of the event, which is run by CUAA students, is to deepen attendees’ relationships with Christ and each other. And if his “turn up” reputation is any indication, Ken will continue to delight those around him with his God-given musical talents and spirited disposition.